As consumers watch another wave of home IoT devices emerge from CES this week, they’ll still be waiting for one technology that can make all those products work together. The ZigBee Alliance, a group of more than 400 companies that make things with the ZigBee wireless protocol, made a bid to provide that unifying technology right before the annual consumer electronics gathering kicks off. On Tuesday, ZigBee announced Dotdot, which it calls a universal language for IoT. Even though ZigBee is best known as an open wireless communications protocol used in many home IoT products, Dotdot is intended for use with any wireless technology. It defines things like how devices tell each other what they are and what they can do, which is important for making different objects around a home do things together. For example, if you install a new connected light fixture in the living room and want it to turn on whenever the front door is opened, the connected lock or sensor in the door will need to know that such a light is out there and be able to send commands to it. There are other such languages, called application layers, vying to become the one that's most commonly used. The application layer is widely expected to be more important than a common networking protocol for unifying IoT because it's becoming easier to include many different wireless radios in one device. The ZigBee Alliance says Dotdot is more mature than other application layers because it's based on ZCL (ZigBee Cluster Library), which current ZigBee products already use. The group has already extended ZCL to work on devices using the Thread wireless network protocol, which uses a radio technology similar to ZigBee’s. Now the Alliance says devices on other types of IP (Internet Protocol) networks could also use ZCL, which is being rebranded as Dotdot. IP is so universal that Dotdot might eventually handle application-layer tasks like device discovery throughout a home, over networks that could include Wi-Fi, Bluetooth, Ethernet and NB-IoT (Narrowband IoT), a low-power cellular system, said Daniel Moneta, chair of the ZigBee Alliance’s marketing group. Equipment makers that belong to the group are asking for these new kinds of network support, Alliance President and CEO Tobin Richardson said. The group hopes to start certifying products with Dotdot later this year and says the first official products could ship by the end of the year. 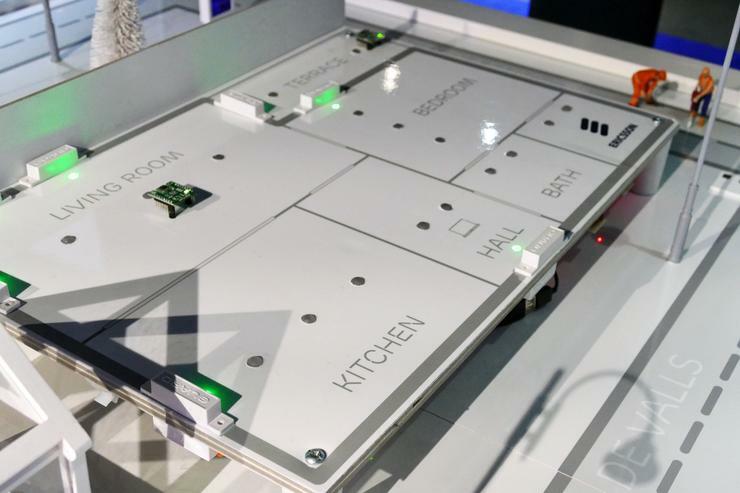 At CES, ZigBee will demonstrate about a dozen Dotdot prototypes from various vendors, including thermostats, lights, window blinds and sensors. But all the prototypes will use Thread, which so far is the only network other than ZigBee that the application layer runs on. Meanwhile, other specifications designed to unify IoT are on the way. The Open Connectivity Foundation (OCF) which was formed last year and recently merged with the AllSeen Alliance, claims its backing by giants including Intel, Qualcomm, Microsoft and Samsung will be able to make OCF the common application layer for IoT. OCF also plans to demonstrate interoperable products at CES.